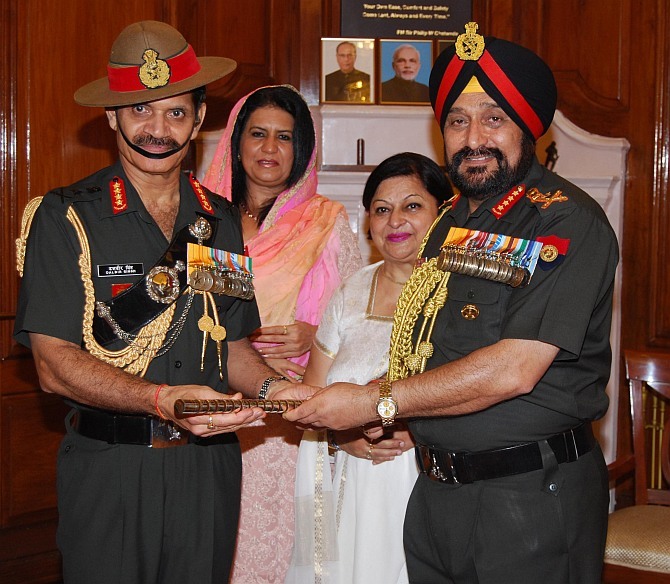 Lt Gen Dalbir Singh Suhag, whose appointment as Army chief had kicked up a row, on Thursday took over as the next head of the 1.3 million strong force succeeding Gen Bikram Singh who is retiring. Lt Gen Suhag was designated as army chief in May by the outgoing UPA government ignoring protests from his predecessor Gen VK Singh and the BJP. 59-year-old Lt Gen Suhag, a Gurkha officer who had participated in the 1987 Indian Peace Keeping Force operation in Sri Lanka, was made the Vice Chief of Army Staff in December last year. He will have a tenure of 30 months as the 26th Chief of Army Staff. Earlier, he had taken over as the Eastern Army Commander on June 16, 2012. He was at the centre of a controversy triggered by discipline and vigilance ban imposed on him by the then army chief Gen VK Singh in connection with an intelligence operation in Assam earlier. The ban on Lt Gen Suhag, the then 2 Corps Commander, was lifted soon after Gen Bikram Singh took over in May, 2012. BJP had questioned the 'hurry' in making the appointment and insisted that the matter be left to the next government. However, soon after the NDA government took over, Defence Minister Arun Jaitley said the new dispensation will continue with the appointment made during UPA rule. Lt Gen Suhag was a Company Commander in Operation Pawan in Sri Lanka in 1987 and commanded 53 Infantry Brigade engaged in counter insurgency operations in the Kashmir Valley from July, 2003 to March, 2005. An alumnus of Sainik School, Chittorgarh, he joined National Defence Academy in 1970 and was commissioned into 4/5 GR (FF) in June 1974. The General Officer has attended various career courses in India and abroad which include LDMC at CDM, Secunderabad in 1997-98, NDC Course at New Delhi in 2006, Executive Course in USA in 2005 and Senior Mission Leaders Course (UN) in Kenya in 2007. He holds the distinction of commanding 8 Mountain Division in Kargil from October 2007 to December 2008. Traditionally, the appointment is made two months ahead of the retirement of the incumbent army chief but the UPA government deviated from this practice when Bikram Singh was appointed in 2012.